This gorgeous 8 x 14 Garden Shed features a gable roof, a standard and a bar window, a premium door and double standard doors. Cabana Village garden sheds are as attractive as they are practical, providing easy access storage for all your garden tools. Include a double door in your design to accomodate your lawn tractor. 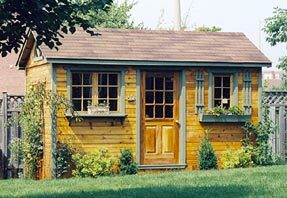 Our garden sheds are constructed with cedar or maintenance-free siding, and cedar doors, windows and trim and come standard with 1/2" plywood roof sheathing and 2x4 SPF framing. Click on the pictures in the filmstrip to view larger images of the pictures shown there. Use the models listed in the design center as a starting point for your garden shed design. Use this design center to price and/or customize this garden shed design. Use the different sizes shown below as a starting point. Watch our design center instructional video and find out how to design and get pricing for this garden shed style in almost any size!